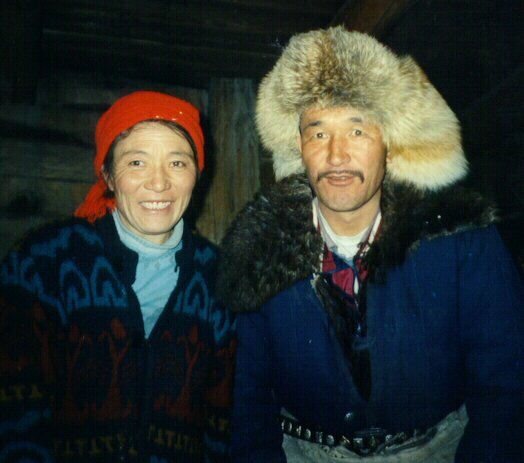 Our Millennium crew consisted of Ariunbolor, Boojum Expedtions' Office Manager form Ulaan Baatar, Canat, our local guide in Olgii and his wife Aika and 5 stalwart travelers, Sheryl Shapiro, Moshe Liron, Matt Nelson, Diane Louis and Michael Ananian. Thanks to Matt for the photographs! 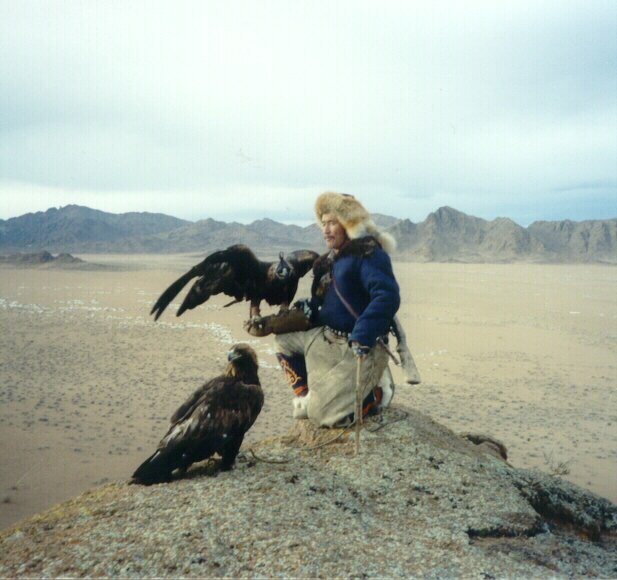 # 1: Ariunbolor and Ramazal, one of the oldest eagle hunters. 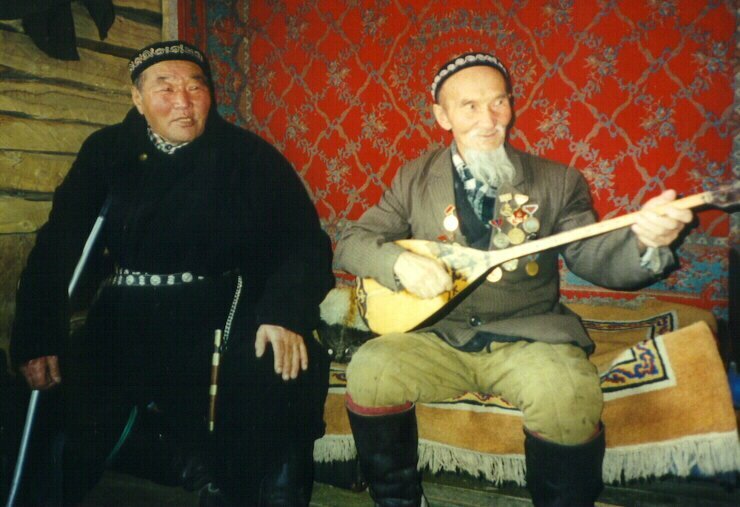 He played dombro, danced and sang Kazakh, Mongol and Russian songs for the group. 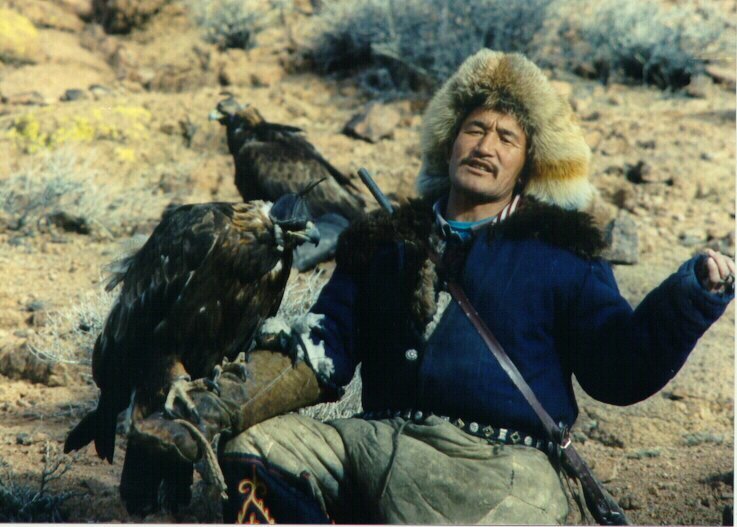 #2: Aralbay, the eagle hunter the group spent the most time with, and his wife Kazna. 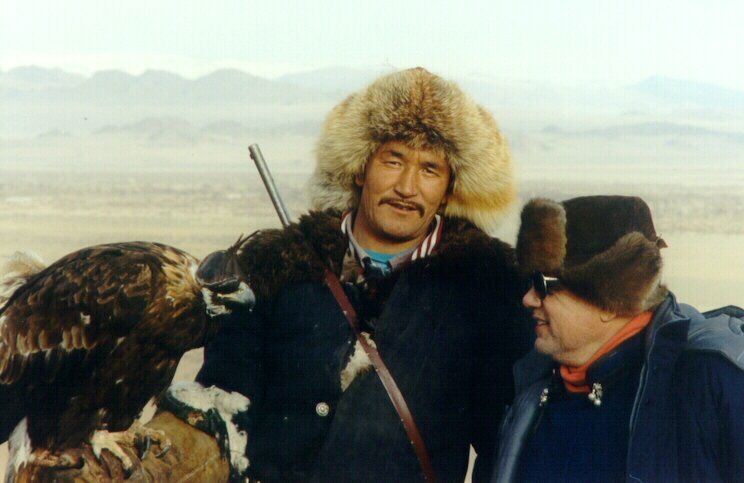 #3 Aralby with one of his eagles. His younger brother was in charge of the other. #3: Aralbay waiting on a high point while drivers (Ariunbolor translated them as "scare boys" beat through the landscape to drive prey (fox and hare) into the open and towards the mountains in the background. #4. 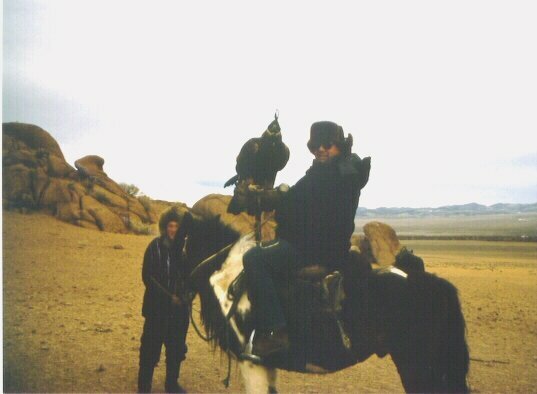 Matt Nelson on Aralbay's horse with eagle. 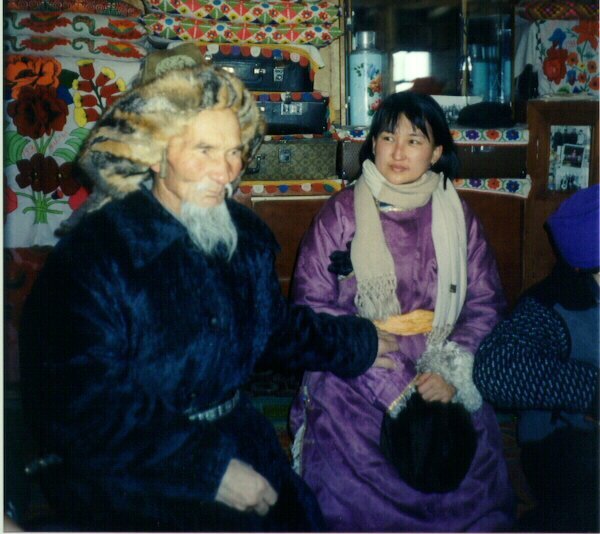 #5: Ramazal with his dombro and his neighbor Kudtiayn. #6 Matt in deel and rabbit skin hat. The hat was a poor choice for fur. One of the eagles took a swipe at the hat and nearly knocked Matt down. That's why it's called "adventure" travel. #7 Matt, being oldest in the group and therefore traditonally the one to serve the meat (horse in this case) learned his job well as he did it at each house or ger that was visited. #8 In front of the eaglehunters' house where the group stayed for a week. 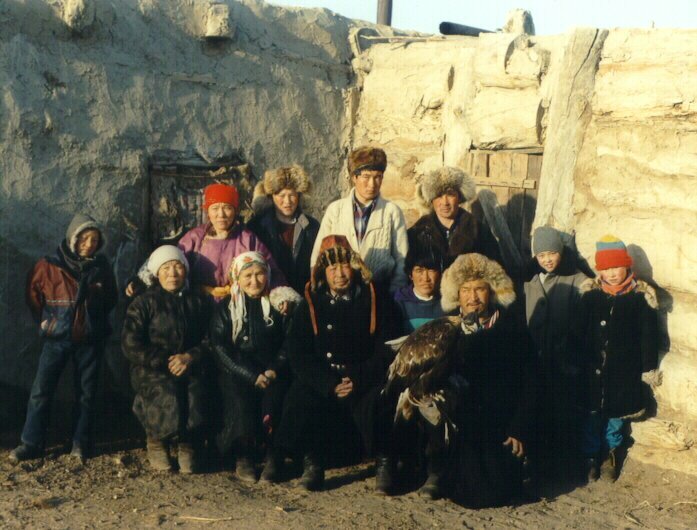 Begu, the neighbor boy (standing on the left in the second row) was loved by everone for his beautiful voice. He is also a much sought after jockey in the Naadam horse races since he is 11 years old but quite small. 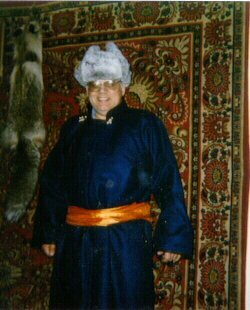 He has had a lot of success winning Naadam races. 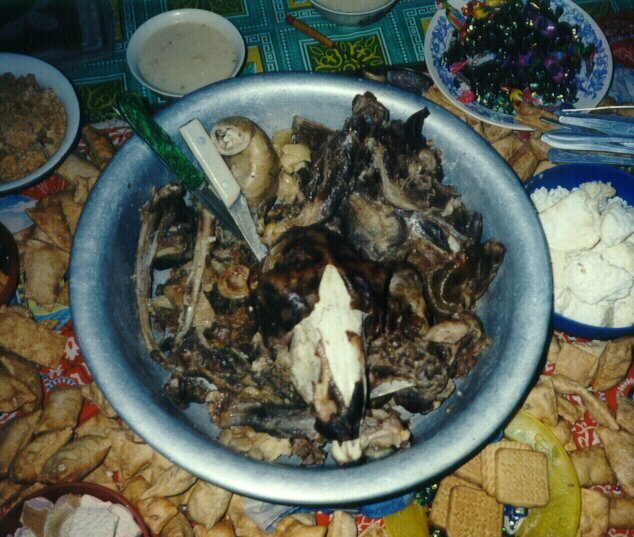 #9 Typical offering in a Kazakh house when honored guests visit. 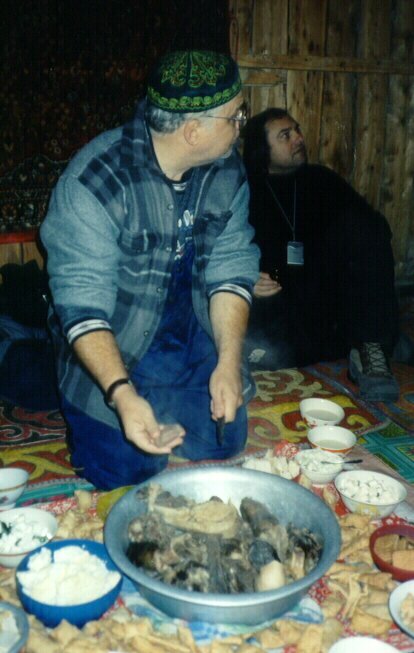 Mostly horse meat (traditional in winter) with some mutton and beef. Hard candies, boiled rice soup with aarol (cheese curds), soft cheese, crumbled dried aarol and fried bread complete the menu. Yes, that is a sheep's head.